Buy 1 for $15.13Buy 2 / Save $0.81!Buy 3 / Save $3.03! The bark of Siberian ginseng has long been used herbally for its role as an adaptogenic energy tonic, an antirheumatic, and an antispasmodic. 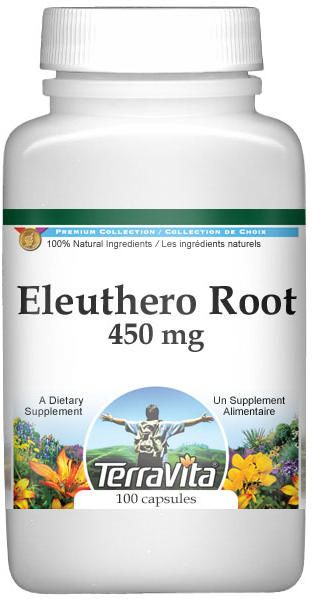 It is used to help increase energy and endurance and it helps support the adrenals, spleen, and pancreas. In biochemical terms, the root of the herb contains eleutherosides, essential oil, resin, starch, and vitamin A.
Siberian ginseng was thoroughly studied by Dr. I. I. Brekhman and other Russian researchers. It was experimentally given to thousands of athletes, factory workers and others with outstanding results. Among 15,350 workers, incidence of health concerns was lowered on the average some 37.1%; among athletes and other individuals whose work requires high levels of endurance and stamina, the results were better running times, work-load capacities and quicker recovery rates after exertion. Only recently have there been successful efforts to cultivate the plant in North America. This is a very welcome development since much of the commercially available powdered or extracted forms have been heavily adulterated with a bogus herb (Hemedesmus indicus). There is some possibility, not as yet proven, that our own Pacific Northwestern devil's-club (Oplopanax horridus), which has traditionally been used to help support good blood sugar levels and other serious health issues by the Northwestern Natives, might possess similar adaptogenic properties.